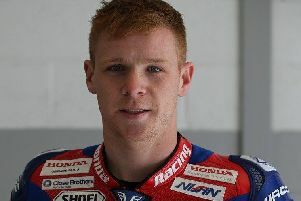 Jason O’Halloran is to campaign the new CBR1000RR Honda Fireblade in the 2008 British Superbike championship and showcased the new bike prior to testing in Spain last week. The new bike will feature a fresh livery and will be used by both O’Halloran and his team-mate Dan Linfoot for their assault on the series this year. Keeping its Honda roots close to its heart, the Superbike livery mirrors the colour scheme on the road-going 2018 Fireblade SP, with the iconic tri-colour synonymous to CBR machinery. It was debuted last week at the Honda team’s first test of the year at Monteblanco, in Spain, where O’Halloran put the bike through its paces. The Australian rider, who now lives in Market Rasen, said: “The weather here has been quite difficult for everyone which is a little bit frustrating, but we got pretty much everything on the test plan done. “We tested a new engine and another chassis and have a fairly radical set-up on the bike so we got through all we needed to. “I am really happy with my pace considering it normally takes me a couple of days to get up to pace, and yesterday we improved the bike in the rain so we are all pleased about that; all-in-all I am feeling positive. “We just need to get a few more laps under our belts before we move on the Guadix next week, then it’s on to the official British Superbike test at Donington Park. Last season O’Halloran was fifth overall in the British Superbike championship and will be seeking some top results to improve his position in this year’s championship. It kicks off at Donington Park over the Easter weekend of March 31 to April 2.